During the Great Depression, a group of UW–Madison scientists looked over several hundred acres of eroded farmland on the outskirts of Madison and envisioned its rebirth. To Aldo Leopold, the pioneering wildlife ecologist and conservation sage, the beat-up farmland offered an opportunity to restore nature in a way that had never been done before. The Greene Prairie at the UW Arboretum. Such an idea is now commonplace, but in the 1930s, it represented a great experiment. Nonetheless, Leopold, Norman Fassett and their colleagues at UW–Madison convinced the university and the city of Madison to give it a try, and the UW Arboretum was inaugurated in 1934. On Sunday, June 21, 75 years later, the university and Madison community will celebrate that visionary decision — and the muddy, multigenerational effort to prove that farmland can be regenerated to a close semblance of its “natural” state. At 8:30 a.m. on June 21, a naturalist will lead a tour of Arboretum wetlands, starting from the Visitor Center, 1207 Seminole Highway. Other events at the Visitor Center will begin at 12:30 p.m. 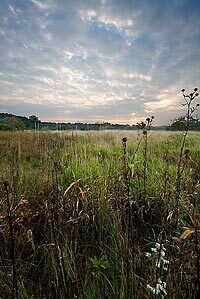 The 1,200-acre Arboretum contains a variety of restored Wisconsin landscapes, but its centerpiece is the 72-acre Curtis Prairie. On this tract, named for plant ecologist John Curtis, Norman Fassett and students began working in 1934, with immeasurable help from about 200 Civilian Conservation Corps workers, led by Theodore Sperry. Refining their scientific expertise through experimentation and trial and error, these pioneering restorationists retrieved seeds and sod from prairie remnants in old railroad tracks and cemeteries, and learned to use farm equipment and fire to write a step by step “recipe” for prairie restoration. Gradually, as their labor bore fruit in the form of beautiful, stable and ecologically healthy landscapes, word spread that it was possible to restore native vegetation. Fueled in major part by UW–Madison alumni, restorations spread into the Midwest and far beyond. Over the years, a combination of research and brute force, fueled by university scientists, graduate students and volunteers, has restored forests, prairies and wetlands in the Arboretum. Today, Curtis Prairie contains 230 plant species and “has been the icon, the model, for the region, for people who are inspired to copy the restoration process,” says Zedler. Despite the successes, Curtis Prairie is being damaged by stormwater carrying sediment, fertilizer and seeds of the highly invasive reed canary grass. Countering these threats, Zedler says, has become the subject of a long series of research projects designed to sustain a great restoration. Various threats to the Arboretum have forced an update to the traditional goals of ecological restoration. For one thing, the Arboretum must consider the impacts of climate change on its ecosystem. And even the standard for success is in question. Formerly, ecologists believed that a high diversity of plant species would protect an established prairie from invasions, and they tended to gauge success by the number of native plant species. Now they are also considering how well a restoration benefits the environment by, for instance, increasing water infiltration to reduce harmful runoff. The Arboretum has an important educational role as an outdoor laboratory. Last fall, for example, about 90 members of a UW–Madison ecology class helped test whether native plants can replace invaders in plots where reed canary grass was treated with herbicide. Student participation in restoration experiments adds to the legacy of the science that began in 1935, says Zedler.